For more than 40 years, Burns & McDonnell has provided design services for airport traffic control towers in the United States and worldwide. Burns & McDonnell can provide the architectural and engineering design for a new structure, modify an existing tower or modernize a structure. We offer design services for full mechanical and electrical systems, fire protection systems, communications systems, weather sensing and arrestor barrier control systems. 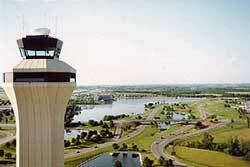 Burns & McDonnell -- Aviation Division, 9400 Ward Parkway, Kansas City, MO 64114. Tel: 816-333-9400; Fax: 816-822-3517.